of fire-tried gold, may by its genuineness lead to praise, glory, and honor when Jesus Christ appears. Pietro (Pietruccio) Cugino, of San Giovanni Rotondo was just six years old when his father took him to see Padre Pio for the first time. 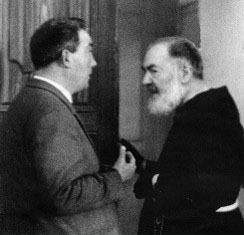 As time passed, Padre Pio grew to love Pietruccio with a fatherly affection. He gave Pietruccio instructions in the Catholic faith and prepared him to receive his first Holy Communion. In the early days, farmers brought their sheep, horses, and donkeys to the monastery to be blessed by Padre Pio. Pietruccio often helped herd the animals onto the square just outside the church. When Pietruccio was twelve years old, he contracted an incurable eye disease and lost his sight. Even though he was blind, he still found many ways to assist Padre Pio. He liked picking the special wild herbs that Padre Pio enjoyed in his salad. Twice a day he went to the post office to collect the mail for the Capuchins. He did the shopping for the Capuchins as well. He became so familiar with the monastery and the surrounding area that he did not need a cane to get about. He knew every stone, every turn, every step and incline by heart. He became almost a permanent fixture at the monastery. Padre Pio once said to some of his friends, “Consider the fact that Pietruccio is indeed fortunate. Because of his blindness, he is not able to see the sinful and evil things in this world.” As a matter of fact, Pietruccio used to thank God that he was blind because through it, he felt that he received many extra graces from Padre Pio, graces that were not give to others. He was allowed to go to Padre Pio’s cell whenever he wanted to. He would often visit Padre Pio in his cell in the evening and stay until Padre Pio got in bed. Then he would kneel at his bedside to receive his blessing. 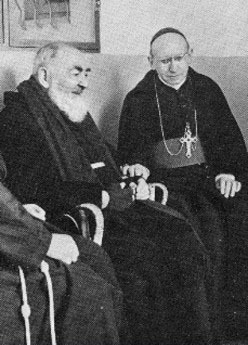 Through the many years of their friendship, Padre Pio kept Pietruccio at his side. When he was weak and unsteady on his feet, he used to say to Pietruccio, “You lend me your arm and I will lend you my eyes.” He would lean upon Pietruccio’s strong arm when he walked from the monastery to the church. When Padre Pio became advanced in years, due to his many ailments, he sometimes had difficulty changing his clothing. Pietruccio counted it a privilege to assist him. Each morning, Pietruccio was given a great honor. He preceded Padre Pio out of the sacristy when it was time for the Mass to begin and was allowed to stand very close to the altar for the duration of the Mass. For Pietruccio, just to be near Padre Pio was a great, inestimable gift. It filled him with a deep joy, a joy that sustained him in all the ups and downs of his life. Every morning when Pietruccio woke up, he would reflect on the previous day. In his mind, he would go over everything that Padre Pio had said and done. Because he loved Padre Pio so much, he wanted to savor every memory. A few days before Padre Pio died, he said to Pietruccio, “I am sorry but I have to leave you.” “What do you mean?” Pietruccio asked. “Let us pray about it,” Padre Pio replied. Padre Pio died a few days later. Pietruccio felt shattered by Padre Pio’s death. The thought of never seeing Padre Pio again was almost too much for him to bear. He began to feel, for the first time in his life, the full weight of his blindness. As he reflected on it, he became convinced that when Padre Pio was alive, he had carried the cross of his blindness for him. At that time, it did not seem to Pietruccio that it was a burden to be blind. But after Padre Pio passed away, he truly felt that it was a heavy cross. There was a woman named Michelina who counted herself as one of Padre Pio’s loyal spiritual daughters. She had met Padre Pio for the first time when she was twelve years old. Every year she traveled from her home in Pescara to San Giovanni Rotondo to visit Padre Pio. After Padre Pio passed away, she continued to pray to him and ask for his intercession. Michelina had experienced many trials in her life. Her husband passed away leaving her a widow at a relatively young age. Her son Alfredo became deeply involved in the dark world of drugs. His life was going from bad to worse. Michelina prayed to Padre Pio every day to intercede for Alfredo and to cure him of his addiction. In her prayers, she told Padre Pio that if he would help her son, she would walk the distance from Pescara to San Giovanni Rotondo to pray at his tomb and offer her thanksgiving. For six years, Michelina prayed daily to Padre Pio for Alfredo. Finally, one day there was a breakthrough. Alfredo had a fight with one of the drug dealers. He decided to break away from the world of drugs forever. His life underwent a complete transformation and he vowed that he would never to go back to his former lifestyle. Michelina was overjoyed. She had not forgotten the promise she had made to Padre Pio. She set off from Pescara to San Giovanni Rotondo with her walking stick and Rosary in hand. She was fifty-six years old. When she arrived in the town of Francavilla al Mare, one of her relatives decided to join her on the walk. He made a good effort but he was not able to continue for very long. Michelina passed through the towns of Termoli, Poggio Imperiale, and San Marco in Lamis enroute to the monastery of Our Lady of Grace. By the time she reached San Giovanni Rotondo, she had walked 120 miles. Her knee was swollen and her exhaustion was great, but other than that, she was in good condition. She felt great happiness when she finally knelt at Padre Pio’s tomb. She prayed in thanksgiving for Alfredo’s deliverance from drugs and for his new beginning in life. Michelina’s relatives, knowing the long and difficult journey she had made, met her in San Giovanni Rotondo. When she finished her prayers and devotions at Padre Pio’s tomb, they offered her a ride back home and she happily accepted. On one occasion, Domenico Savino traveled on business from his home in Velletri to the northern part of Italy. On the return train trip home, he struck up a conversation with one of the passengers, a young man named Victor. Victor’s sincerity and goodness were so apparent that Domenico liked him at once. As the two men talked together, Victor shared some of the burdens that were in his heart. He had used the last of the money in his family’s savings in order to travel to Milan in search of work. Unfortunately, he was not able to find a job there. His aged parents were in need of care and Victor was deeply concerned for them. He loved them both very much. Domenico’s heart went out to Victor. It seemed that he had more than his share of difficulties. Not long after, Domenico was making preparations to visit Padre Pio’s monastery in San Giovanni Rotondo. On the way to the monastery, Domenico passed through the town of Campania, where Victor lived. He stopped at Victor’s home and invited him to accompany him on the trip. “I assure you that you will feel the wonderful spiritual benefits of visiting the monastery,” Domenico said to Victor. “You can talk to Padre Pio about your many difficulties and ask him to pray for you,” he added. Victor was very happy to accept the invitation. The trip to Padre Pio’s monastery had a transforming effect on Victor. While there, he made many visits to the little church of Our Lady of Grace and spent much of his time in prayer. He felt renewed in body, mind, and soul. In San Giovanni Rotondo, Victor bought two photographs of Padre Pio. He was going to put one of the photos in his home. He decided that he was going to keep the other photograph with him at all times. The days passed far too quickly and soon it was time for the two friends to return to their homes. A month later, Domenico received a letter from Victor. He wrote that he had found work in a mine in Belgium and was doing well. He was very happy because he was now able to send money home to his parents. He told Domenico that he made sure that he had Padre Pio’s photograph with him at all times. It was a spiritual connection to Padre Pio and it filled his heart with a great sense of peace. Some time later, Domenico received another letter from Victor. Victor wrote that a terrible disaster had struck the mine where he worked. He and some of the other miners had been trapped underground for many hours when the mine shaft that they were working in collapsed. During that terrible time of waiting, suspended between life and death, Victor talked to the other miners about Padre Pio. He also had Padre Pio’s photograph with him. It took many hours of exhausting work before the rescue crew was able to bring all of the miners to safety. The words that Victor spoke about Padre Pio, and the photograph which he shared, proved to be a great consolation to all the miners. Later on in the day, the Archbishop knelt before Padre Pio in order to make his confession. Padre Pio’s face was serene and his dark eyes were deep and very beautiful. “You are a bishop,” Padre Pio said. “You must give me your blessing.” Padre Pio then took the Archbishop’s hand and kissed it. Archbishop Tortola learned by experience the truth of Padre Pio’s statement. One night, while staying at the monastery of Our Lady of Grace, the Archbishop heard moaning sounds coming from Padre Pio’s cell. The next day, he asked the Father Guardian if he knew what the sound could have been. The Father Guardian told him that even when Padre Pio was asleep, he continued to suffer through the night. He never slept more than a few hours, but even then, he was not able to have any relief from his pain. Giuseppe Bassi, one of Padre Pio’s spiritual sons, used to attend Padre Pio’s Mass when it was held in the small and rustic 16th century church of Our Lady of Grace. At that time, it was Padre Pio’s practice to say his Mass at the side altar of St. Francis. On one occasion, Giuseppe arrived at the church at 4:30 a.m. and waited in the darkness along with many others for the church to open. While they waited, some of the people who were standing in line near Giuseppe, began to converse together. Giuseppe listened with interest to the stories of Padre Pio that the devotees were sharing. One man explained how he had been healed of a very serious back condition through the intercession of Padre Pio. As soon as he finished his story, another man spoke up and said, “That is a lie! I am certain that you were not healed by Padre Pio or by anyone else!” Giuseppe and the others who were present were shocked at the man’s unkind remarks. The man who made the unkind remark looked to be about twenty-five years old. His skin had an unhealthy, sallow color to it. From time to time, vulgar words would escape from his lips. He did not seem to feel the slightest sense of shame using profanities in such a sacred place. Giuseppe heard the man say that he was from the town of Romagna. That was as much as Giuseppe wanted to know about him. His sarcasm and his anger caused the others who were nearby to feel the same way as Giuseppe did. The man moved about in a nervous way and his body seemed to jerk when he shifted his weight from one side to the other. Among the devout and prayerful people who were gathered in front of the monastery church, the man seemed very much out of place. Before long, one of the Capuchins came out and unlocked the doors to the church. Once inside, Giuseppe quickly made his way to the sacristy. Already, about fifty men were gathered there. Because of his previous visits to the monastery, Giuseppe knew the routine well. A few minutes before 5:00 a.m. the sacristy door would open and Padre Pio would appear. He would then make his way to the side altar of St. Francis where he said his Mass. On this particular morning, as Padre Pio opened the sacristy door, his face was marked by an expression of deep suffering. All of the men, who had been waiting to see him, knelt down. Padre Pio dragged his feet as he made his way through the crowd. To some, he would offer his hand, to others, he would not. He had his own reasons for doing so. When Padre Pio saw the man from Romagna kneeling in the sacristy, he paused momentarily and placed his hand on the man’s head. He then gave the man his blessing. From what Giuseppe had already witnessed, the young man certainly needed that blessing. At Padre Pio’s touch, the man’s entire body started shaking. He began to cry. Everyone present could hear his heartbreaking sobs. “Get up, young man,” Padre Pio said to him in an encouraging way. “It is good for you to cry. I know that you are sorry. You must have courage.” When the man finally rose to his feet, he seemed to be at peace. Later on that morning, Giuseppe returned to his hotel. There in the lobby stood the man from Romagna. He had evidently booked a room in the same hotel. He was talking to several people who were standing in the hotel lobby with him. Giuseppe decided to join the conversation. The man from Romagna explained that he had come to San Giovanni Rotondo mainly out of curiosity. One of his co-workers had told him about Padre Pio and he found the information interesting. “As soon as Padre Pio touched me and looked at me with those eyes of universal judgment, I felt terrified. I felt an overwhelming urge to cry,” he explained. Giuseppe noticed that the man’s physical appearance looked different. Before, he looked unattractive and unwell. Not anymore. He now had a glow of serenity and happiness on his face. Those few moments with Padre Pio were enough to bring about a remarkable transformation. There was a woman (name withheld) who worked in Italy for an international Catholic organization. Her job responsibilities required her to spend much of her time in Rome, where she was in close communication with the Congregation for the Doctrine of the Faith. In addition, her job required her to travel to many different parts of Italy. It seemed like whatever city she happened to be in, people wanted to talk to her about Padre Pio. They often encouraged her to visit Padre Pio’s monastery in San Giovanni Rotondo but she had no desire to do so. San Giovanni Rotondo was an impoverished village in the southern part of the country. Looking at a map, it was found on the “spur” of the Italian boot. It was not one of the towns that her organization required her to visit and she saw no good reason to make a special trip there. She began to feel irritated by the constant talk she heard about Padre Pio. She grew to dislike even the sound of his name. The woman observed that most of the people who spoke to her about Padre Pio seemed to be overly zealous and even fanatical in their devotion to him. In her estimation, they were on the wrong track. She thought it was a shame that so many people had put Padre Pio on such a high pedestal. In 1956, troubling developments occurred in the Catholic organization that the woman worked for. Once again, she heard the common refrain, “You should go to San Giovanni Rotondo and ask Padre Pio for advice. He will be able to help you.” To her, the suggestion seemed absurd. Padre Pio was a priest who practically never left the seclusion of his monastery. In all probability, he knew nothing about the Catholic organization that she worked for. He would be the least likely person to know how to advise her. The woman sought the counsel of two priests whom she held in great esteem. They both were very familiar with her organization, having implemented it in their own diocese. Both priests listened with attention as she explained the problems within the organization. They advised her to the best of their abilities. However, her immediate supervisor had a completely different idea as to the solution. The woman, after much thought, finally made her own decision on the best course to take. Nevertheless, she was continually tormented by doubts about the decision she had made. That year, several of the woman’s friends, including one nun as well as a dear friend who was a priest, invited her to spend Christmas in Naples with them. They knew that she was under a lot of pressure from the many responsibilities at her job. She accepted their invitation with gratitude. One day, during the Christmas vacation, her friends announced that they were making a trip to San Giovanni Rotondo. They wanted to attend Padre Pio’s Mass and they also wanted to deliver a number of Mass offerings which they had received from their friends who were not able to make the trip. Although the woman had no desire personally to visit the monastery of Our Lady of Grace or to meet Padre Pio, simply to please her friends, she agreed to go. Even though she had previously thought that it would be futile to talk to Padre Pio about her work concerns, she reconsidered. As long as she was going to be visiting his monastery, if the opportunity presented itself, she would try to speak to him about the matter. At 4:15 a.m. the woman and her little group stood outside of the church of Our Lady of Grace, waiting in the darkness for the doors to open. It was the middle of winter and bitterly cold. When the church doors opened at 5:00 a.m. everyone rushed inside, hoping to find a good seat close to the altar. What the woman and her companions had not bargained for, was the conduct of some of the local women of the area. Without regard for anyone, they pushed, pulled, and elbowed their way to the best seats in the church. The kind nun, who was one of the woman’s companions on the trip, had managed to find an excellent seat on the very front bench. Hard to believe but entirely true, the nun was unceremoniously removed from her seat and knocked to the ground. The rude conduct in the church of some of the “locals” had been a disgraceful scene to witness. It was almost unbelievable. The woman not only blamed the locals for their outrageous behavior, she also blamed Padre Pio. After all, he was the cause of all the frenzy. After a time, Padre Pio came out of the sacristy. Silence then descended upon the little church. From his first steps up the altar until the end of the Mass, he remained completely absorbed in prayer. The woman suddenly found herself carried into what she described as “another world.” Attending Padre Pio’s Mass was nothing like she had ever expected. She found it to be a “supernatural experience,” and was deeply edified. The priest who had come from Naples with the woman and her other companions had been to the monastery of Our Lady of Grace several times before. He had even visited Padre Pio in his cell. Arrangements were made so that the woman and her party would be able to greet Padre Pio before they returned to Naples. They waited in the appointed hallway so that they could speak to him when he passed from the sacristy to the door that led to the Capuchins’ cells. As it turned out, some of the local women, who had caused so much havoc in the church that morning, had come to wait for Padre Pio in the very same spot. Finally, the door of the sacristy opened and Padre Pio appeared. Assisted by two Capuchins on either side, he moved slowly down the corridor. The woman was close enough to get a good look at him. Padre Pio’s face was beautiful. It seemed to her to be the most beautiful face she had ever seen. His large, dark eyes, which registered both love and pain, reminded her of the suffering Christ. As Padre Pio drew closer, the locals began to press upon him and crowd him. Not wanting to cause him any more discomfort than what he was experiencing at that moment, the woman drew back. She now stood behind the first row of women in the corridor. Padre Pio then paused and finally stopped in front of the woman’s two companions and spoke to them. The woman realized that she was no longer in a good proximity to speak to Padre Pio. If only she had stayed in the front row with her friends, she too would have had a chance to speak to him. The many problems she faced at her place of employment suddenly flooded her mind. For a long time, her work situation had been a source of mental agony for her. She thought of the important decision that she had to make soon. She regretted that she would not be able to speak to Padre Pio about it. Much to the woman’s great surprise, Padre Pio then looked straight in her direction. He smiled at her with great love and held out his hand to her. She had the distinct feeling that he was aware of all the thoughts that were in her mind at that very moment. As she looked in his eyes, she suddenly knew the right course to take regarding her work. Exactly how this could happen, she did not know. The doubts that had plagued her for such a long time, vanished. Without saying one word, Padre Pio had answered her urgent need. A peace, like nothing she had ever experienced before, swept over her. She was assured beyond a shadow of a doubt, that all would be well.